It's time for this month's Improv Challenge! 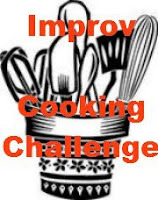 The premise of the Improv Challenge is easy: each month there are two assigned ingredients. 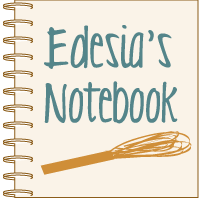 The participants must make a recipe using both ingredients and blog about it. This month's assigned ingredients were beans and bacon. Great combo! I knew exactly what I wanted to make. My first thought was baked beans. I love baked beans. Sweet, with a slightly tomato-y tangy sauce, made even better with some beautiful bacon crisped on top. Mmm, can't go wrong with that. But have you ever had savory baked beans? You don't see them very often, but they are just as tasty as their sweet counterparts. And they are equally perfect for that end-of-summer picnic you've been invited to. I made these for our church picnic a couple of weeks ago. 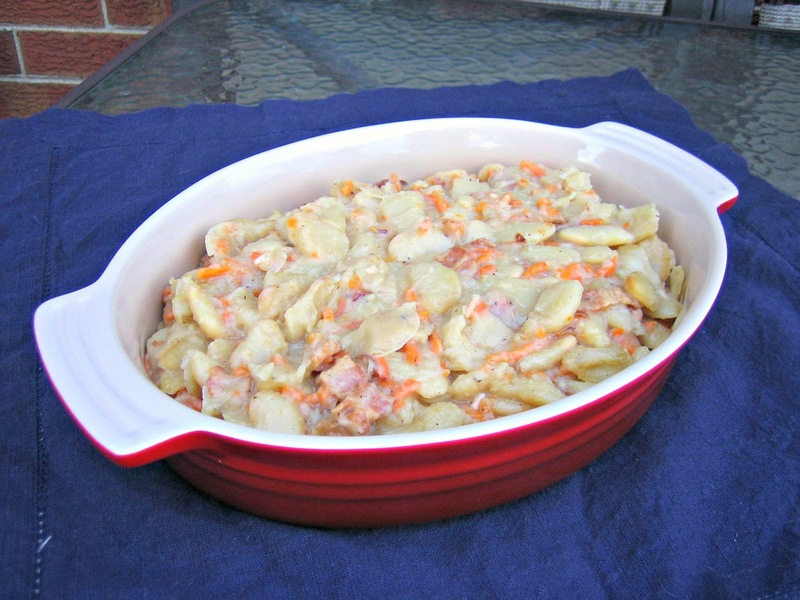 Perfect potluck side dish. I got this recipe from Cooking Light a few years ago. 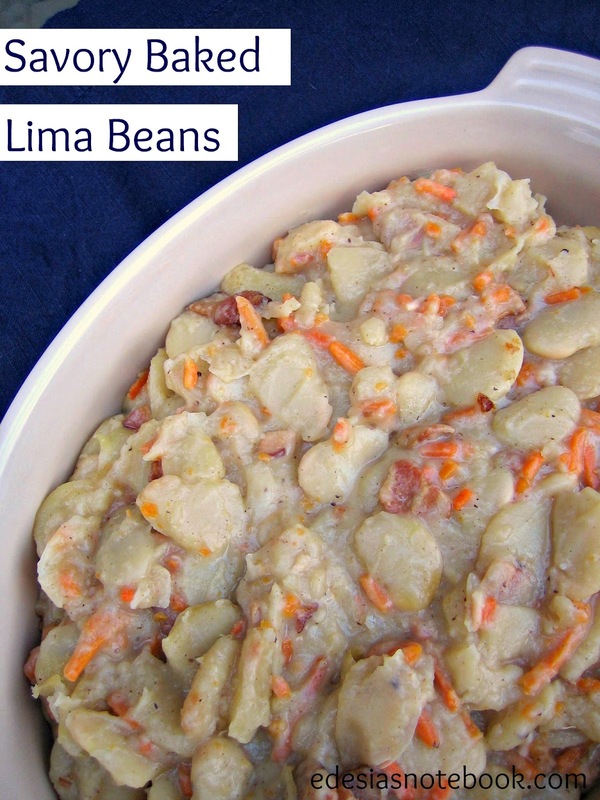 This recipe uses large lima beans, onion, carrot, and of course, bacon! Rinse beans. In a Dutch oven, combine beans and 10 cups cold water. Bring to a rolling boil; boil for 2 minutes. Remove from heat; cover and let stand 1 hour. Drain the beans, reserving 2 cups of the soaking liquid. Rinse and wipe out the Dutch oven. Cook bacon in the Dutch oven over medium heat until crisp. Remove bacon from pan with a slotted spoon; set aside. Add onion and carrot to drippings in pan; sauté 5 minutes or until beginning to soften. Add beans, bacon, reserved bean water, butter, and salt; stir well. Cover and bake for 2-2½ hours or until beans are tender, stirring every hour. When done, taste for seasoning, adding more salt if necessary. My six-year-old daughter, Lena, who doesn't like sweet baked beans, loves these savory ones. I was surprised because I usually can't get her to eat beans of any sort. They were also popular at the church picnic. I use the quick-soak method for preparing the beans. It's faster much faster and I think it gives great results. The beans come out perfectly tender. You will find that some of the skins slough off, but not too many. I think this dish could very easily be adapted for the slow cooker. I would go ahead and do the quick soak on the beans, then cook the bacon and saute the onions and carrot just as listed above. Then instead of baking it, put it in a small slow cooker. I think I would try cooking it on high, but I'm not sure how long it would take. Definitely still stir it every hour to get that creamy consistency. I will have to try it this way next time I make it. So if you're looking for a great dish to take to your upcoming Labor Day cook-out, give this recipe a try. People will be pleasantly surprised that baked beans can be savory! Check out all the other great beans and bacon recipes below and come back next month to see what I make with milk and honey! Sounds delicious. I love finding new and different sides! My daughter sounds like yours. She will not eat beans. I wonder if she'd go for this savory version. It sounds so good. I know the rest of us would love it. Chicken Bacon Ranch Pizza & An Accomplishment!